Team Al Mouj Muscat (OMA) have kept their dreams of dethroning EFG Sailing Arabia – The Tour champions EFG Bank Monaco (MON) alive by pipping them to victory in the nail-biting final offshore leg of the Arabian classic. In one of the closest leg finishes ever seen in seven editions of EFG Sailing Arabia – The Tour, Team Al Mouj Muscat snuck across the Leg 5 finish line in Dubai just one second ahead of EFG Bank Monaco after 34 hours of intense racing from Doha. 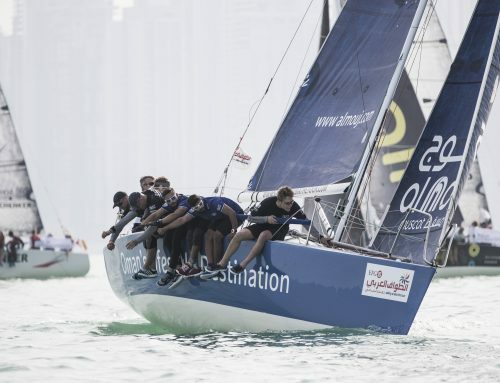 The two rival crews traded blows – and positions – throughout the 205-nautical mile leg, the fifth and final stage that makes up the 763nm race around the Arabian Gulf. 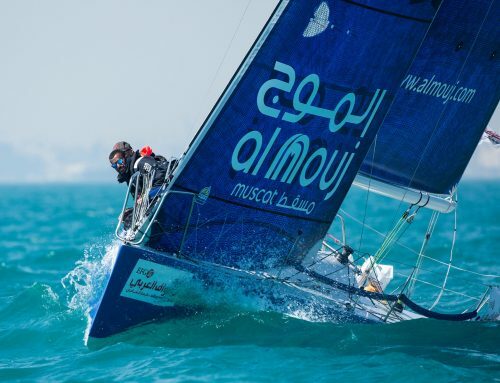 They came into the finish line off Dubai’s iconic Palm Jumeriah late last night neck and neck but Team Al Mouj Muscat, under the leadership of French sailor Christian Ponthieu, just nudged ahead to pick up their first offshore win of the event. 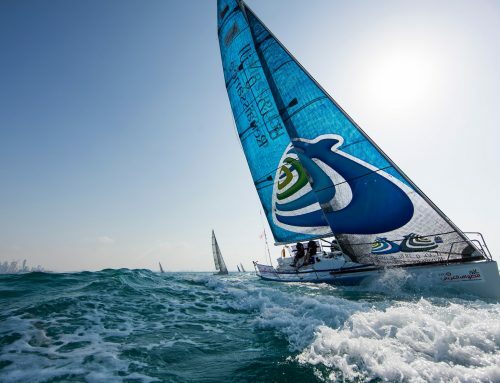 Crucially the win moves Team Al Mouj Muscat to within two points of their arch rivals ahead of tomorrow’s final showdown of EFG Sailing Arabia – The Tour, a series of up to three in-port races. 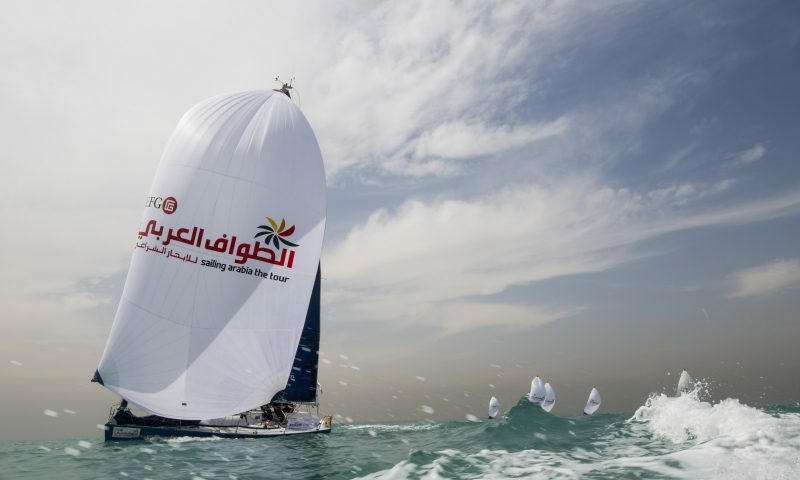 EFG Bank Monaco have been crowned EFG Sailing Arabia – The Tour champions the past three years but Team Al Mouj Muscat, runners-up in 2016, could usurp them if they can better their rivals around the short racecourse. The result is pending a protest brought by EFG Bank Monaco against Team Al Mouj Muscat, who they allege sailed into a restricted zone. “We don’t like to protest other teams but it’s part of our job, part of the game,” said Thierry Douillard, skipper of EFG Bank Monaco. 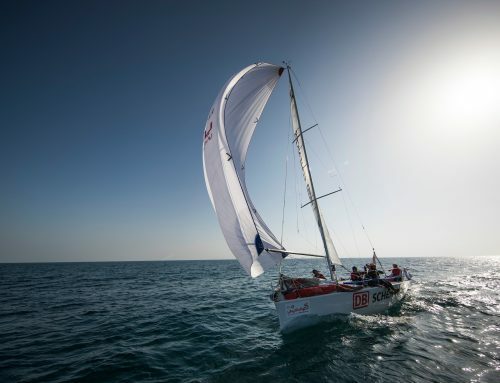 DB Schenker (GER) took sixth ahead of Team Averda (GBR), while Bienne Voile (SUI) retired from Leg 5 after running aground on a small island west of Abu Dhabi. No-one was injured and their yacht sustained only minor damage before being towed to deeper water by the EFG Sailing Arabia – The Tour committee boat. Following the conclusion of the Dubai in-port race series a closing ceremony will take place at Oceana Beach Club, during which the winners of EFG Sailing Arabia – The Tour 2017 will be crowned under the patronage of Sheikh Khalid bin Zayed Al Nahyan, President of the UAE Sailing and Rowing Federation and wit the presence of H.E. Dr. Khalid bin Said Al Jaradi, the Sultanate of Oman Ambassador to the UAE.